There is much to respect about the biopic Te Ata, which tells the story of the same-named Native American performer and storyteller. 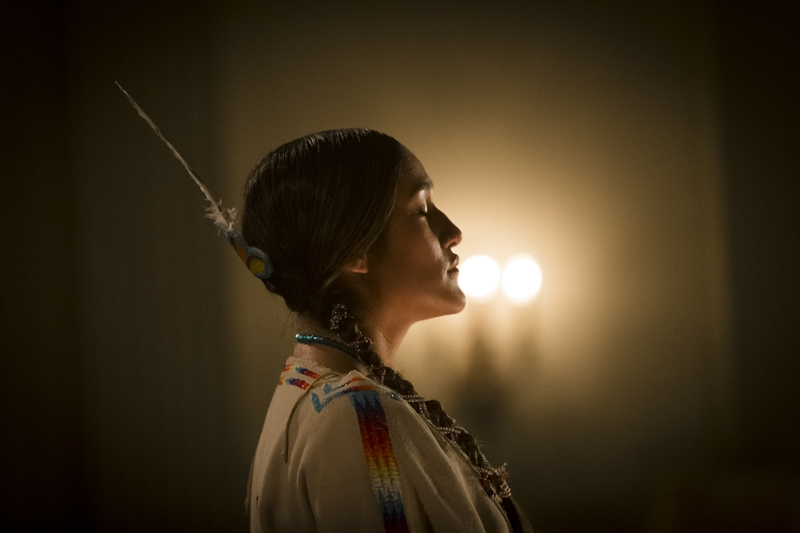 The movie has an excellent cast with recognizable faces like Gil Birmingham and Graham Greene; the script from Jeannie Barbour and Esther Luttrell is tightly written and well-paced; and Q'orianka Kilcher has a role worthy of her considerable charm. And while the direction and production design seem a little made-for-TV, this is still a story that needed to be told, one which unfurls enjoyably and educationally here. It’s been 12 years since Kilcher played Pocahontas in Terrence Malick’s gorgeous, evocative The New World, and in Te Ata, Kilcher has a scene where someone dismissively calls her—a Native American of Chickasaw heritage, dreaming of making it as a mainstream actress—by that woman’s name. This is after she’s rejected from auditions, objectified with skimpy fringed outfits, and otherwise ignored and demeaned. 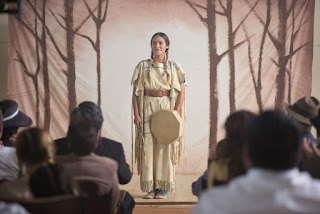 Through all that crap, you’ll identify and sympathize with Kilcher, who gives a riveting, fantastic performance as Mary Frances Thompson, the popular storyteller who brought Native American stories to countless audiences across the United States under the stage name Te Ata. But before Fisher was criss-crossing the country, bringing her act to various small towns and increasingly large audiences, she was a child growing up in the Chickasaw land before it became Oklahoma. One of many born to Chickasaw father T. B. Thompson (Birmingham) and German mother Bertie (Brigid Brannagh), Mary Frances comes of age when her uncle Doug (Graham Greene) is battling with the U.S. government for more funding and support for their community. The smirking, belittling “democracy” offered by the white men representing the U.S. government is frustrating for Doug but infuriating for T.B., who wants to forbid Mary Frances from attending college, going to New York City, or pursuing her dream of Broadway. But Mary Frances does all three anyway against her father’s urging to settle down with a “nice and normal” life; instead, Mary Frances heeds Doug’s observation that “People are afraid of what they don’t know” and sets out to teach them through her storytelling. There are challenges, of course. Her roommate at the Oklahoma College for Women is judgmental and doesn’t pick up on Mary Frances’s overwhelming sarcasm when she says of her placement at the college, “Yes, we Indians are very grateful.” She’s first rejected from the Carnegie Institute of Technology, who tell her to apply again without any consideration of her talent or her effort. And the white audiences that Te Ata performs for are politely inquisitive about the treatment of Native Americans by the U.S. government, but they don’t want real answers to their questions. They want Te Ata’s stories and that’s it, not her honest experiences or opinions—not in all their isolation, oppression, and pain. That’s not to suggest that Te Ata is a dark film; it’s quite the opposite, thanks to bright lighting, natural locations like forests and fields, and Kilcher’s ever-sunny disposition. 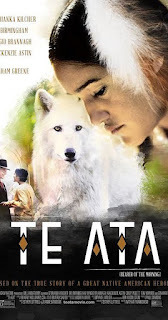 There is lots of positivity and reverence here in how Te Ata presents her stories, and Kilcher absolutely nails the performative scenes, with powerful emotion and graceful physicality. It’s even more impactful, then, when her even-keeled optimism is contrasted with disgust at rude casting directors or sadness at her father’s possessiveness. Kilcher gets all the different aspects of both Mary Frances and Te Ata right, and she’s the charismatic magnet of this whole thing. There are some elements of the film that seem simplified—her relationship with her future husband seems particularly sped up, and her parents’ personalities are somewhat flattened—and there is a repetitive trend later in the film that involves white people over and over again telling Te Ata what an important responsibility she has. Overall, though, Te Ata wants to tell one particular story, and it does so well. For anyone who doesn’t know who Te Ata was—and there are absolutely too many of us—this biopic is inspirational and necessary.